50ml eliquid Strawberry-Banana the perfect blend of fragrant plump strawberries and sweet tree-ripened bananas. 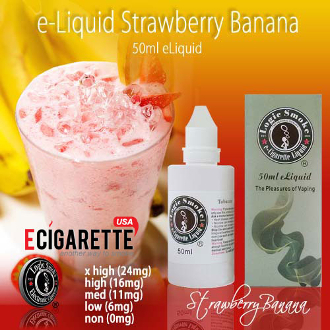 Logic Smoke Strawberry-Banana 50ml eliquid will satisfy your taste cravings. A fabulous fruity blend all by itself or it can be combined with many of our other Logic Smoke e-liquid flavors. Some of our best electronic cigarette liquid favorite mixers are the cheesecake, mango, pineapple, orange or peach. Or add a touch of our cream flavored e-liquid to create the taste of a strawberry-banana ice cream or smoothie. With the perfect blend of an 80/20 PG/VG mix (propylene glycol and vegetable glycerin: organic, food grade preservative compounds), you'll get the best flavor concentration along with the perfect amount of vapor to satisfy your vaping needs. The 50ml eliquid bottle is a convenient and economical size for purchasing in quantity. Fill your clearomizer or other e-liquid atomizing device directly from the 50ml eliquid bottle or use it to refill your smaller travel-size e-liquid bottles. You'll be ready and have liquid on-the-go at any time.